Children have to stand under a sun lamp every day in the Russian northern port of Murmansk where there is permanent night. Bolshoi Theatre, Moscow; Irina Zibrova, a young corps de ballet dancer backstage tying up her ballet shoe, 1995. Sviblova, writer and director, curator of the Moscow House of Photography, 2002. Riche class of Russia; strippers at Hollywood Nites club on Nievsky Prospect in the centre of St Petersburg, 2001. Riche class of Russia; newly opened trendy Japanese restaurant in downtown Moscow, 2001. Tbilisi, Georgia; candles are lit during a church service, 1999. Sulphur baths in Tbilisi, Georgia. 1991. Georgia; Abkhazian mother child refugees in Tbilisi subway, 1999. Rebirth of a nation; female teachers registering for work after 5 years of forced unemployment, the Aishee Dorani high school for girls, Afghanistan, 2001. Rebirth of a nation; a soldier is treated by a Russian doctor in a tent hospital set up by Russians soldiers, Afghanistan, 2001. 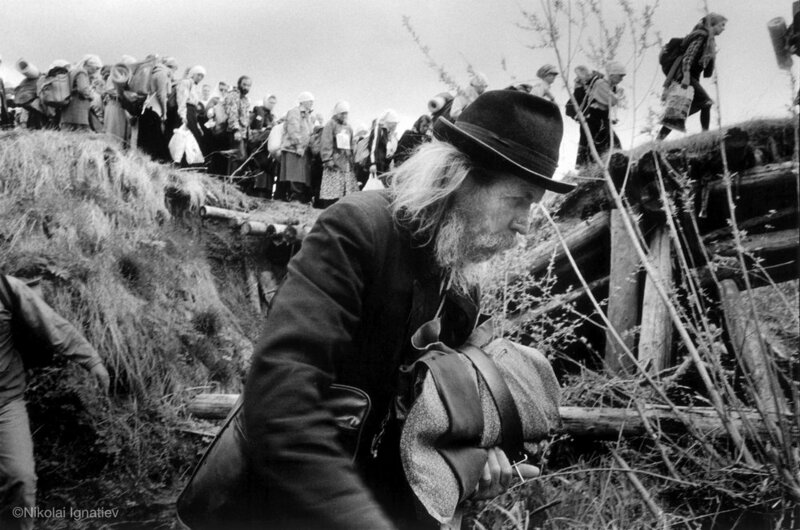 Pilgrimage to Velikaya river, Russia, 1995. Russian Orthodox believers rest as and when the priest announces a stop. Pilgrims on a six day pilgrimage in Russia to the Velikaya River, 2000. Babushkas shelter from the rain during a pilgrimage by putting plastic bags over their heads, 2002. A babushka on a pilgrimage in North Russia wearing a plastic bag to shelter her from the rain. 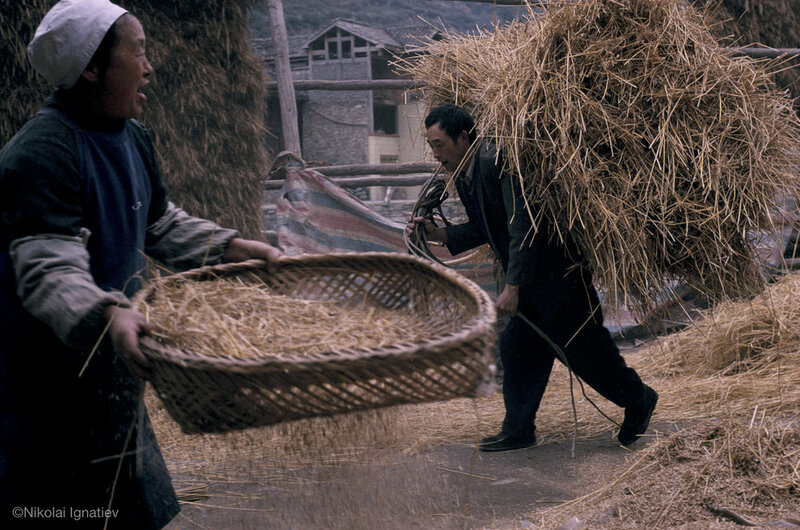 They walk for six days, 2000. Pilgrims crawl through the roots of a tree at the end of a 3 day pilgrimage without sleep for a miracle, 2000. Russian pilgrim immerses himself in a holy spring during a pilgrimage on the Velikaya River, 2000. Pilgrims rest during a rare stop on their six day, 160 mile pilgrimage to the Velikaya River in northern Russia, 2000. A babushka lies exhausted on a table in a derelict church on the third day of a pilgrimage with only 2 hours sleep a night, 2000. Velikaya River Pilgrimage, in northern Russia. Reflections of the pilgrims, 2002. Russian orthodox priest with a child during a six day pilgrimage to the Velikaya River with only a few days sleep a night, 2002. Kumbh Mela, Allahabad, India; women drying sarees in the breeze, 2001. 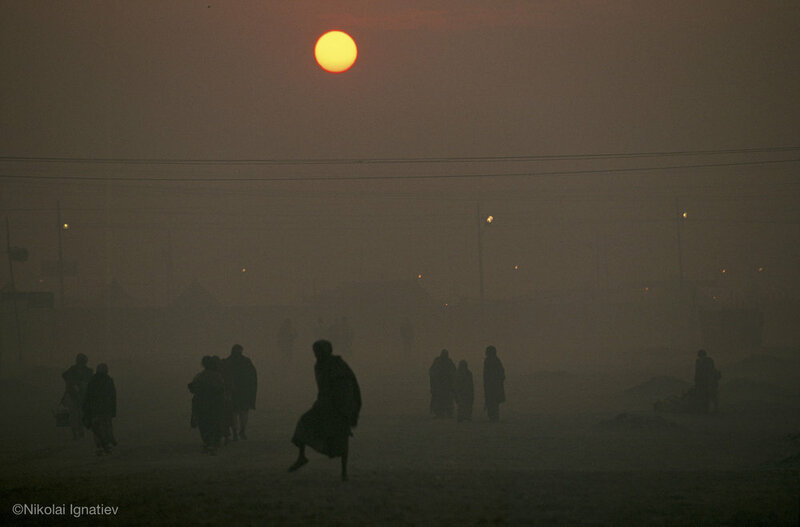 Kumbh Mela, Allahabad, India; as the sun sets and pilgrims return to their camps, smoke from wood fires creates a thick smog, 2001. Kumbh Mela, Allahabad, India, 2001. Kumbh Mela, Allahabad, India; a pilgrim gives rice to beggars, 2001. Kumbh Mela, Allahabad, India; millions have gathered at the confluence of the Yamuna and Ganges rivers, 2001. Kumbh Mela, Allahabad, India; pilgrims fetch drinking water in the early morning mist, 2001.